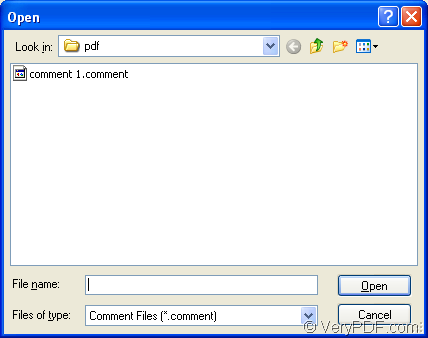 When you want to comment the same kind of PDF document, you may use the same comment. But it is complex and boring to write the comment again and again. Please don’t fidget. The powerful application PDF Editor can help you resolve this problem. 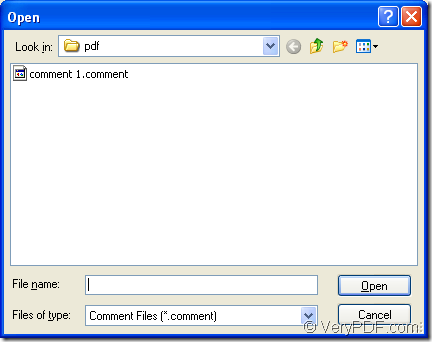 You can just import the same pdf comment file to the pdf document that you want to comment. If you want to use the application, please download it at first. The following URL is for downloading the free evaluation version of PDF Editor: http://www.verypdf.com/pdf-editor/pdfeditor_setup.exe. If you want to use all the functions of it without any limitations, please buy the application at its homepage: http://www.verypdf.com/app/pdf-editor/index.html. Please open PDF Editor at first. This article provides three kinds of methods for you to open the application. The first one is to double click the application icon if you have created one when you install it. The second one is to right click the icon and click “Open” in popup dropdown list. The third one is to open the application from all programs installed on your computer via clicking “Start”—“All Programs”—“VeryPDF PDF Editor v2.6”—“VeryPDF PDF Editor”. The next procedure is to open PDF document in PDF Editor. Please click “File”—“Open” to open “Open” dialog box. Or you can click “Open” button in the toolbar to open this dialog box in which you are enabled to choose the pdf document which need to be imported comment. You can also take the shortcut key “Ctrl”+ “O” to help you open the same dialog box. Please see the inputted pdf document in Document Pane of PDF Editor in Figure 1. You need to click “Tools”—“Edit Comment” or click “Edit Comment” button in Basic toolbar to open the comment status. Then the four comment tools button in comment toolbar will be available. Now please click “File”—“Import”—“Import Comment” for opening “Open” dialog box which is shown in Figure 2. In “Look in” dropdown box, you are able to find the location for the pdf comment file. Then please click the file you have found and click “Open” button to open it in PDF Editor. You will find the comment appear in PDF document and you can drag it to any position and you can edit it by double clicking the rectangle. If you want to scale it, you can regulate its width and height by dragging the angle or the middle of the edge. Then please save pdf comment to your document via clicking “Save” button in toolbar or click “File”—“Save”. Then you can create the new pdf document by clicking “File”—“Save as” to open “Save as” dialog box in which you are able to save the pdf document. How to edit the comment when it’s added to a pdf file? This entry was posted in PDF Editor and tagged pdf comment. Bookmark the permalink.